Abstract: Introduction: Use of misplaced NG tubes is a 'never event'. Between September 2011 and March 2016 there were 95 incidents reported nationally where medications or food was administered into patient’s respiratory tract or pleural cavity. At least 45 of those were associated with inaccurate CXR interpretation by junior medical staff. NPSA and NHS England issued another alert in 2016 urging hospitals to take action. 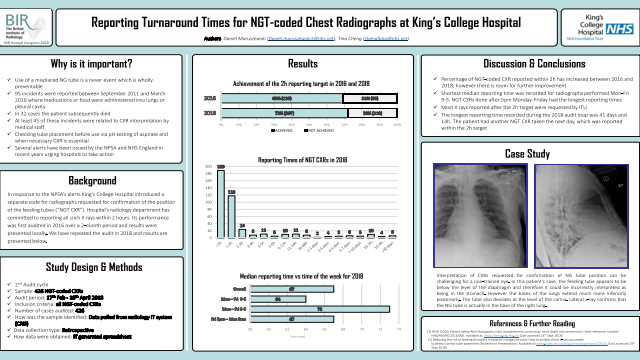 At King’s College Hospital in London a separate NGT request code for chest X-rays was developed and the radiology department has committed to reporting all NGT-coded radiographs within 2 hours. Initial audit looking at reporting turnaround time over a 2-month period was undertaken in 2017. Results were presented locally. A second audit has now been done in early 2018. Methods: Data for February-April 2018 was collected from the hospital database and all NGT-coded chest X rays were included in the study. Times when radiographs were taken and when the formal report was issued for each film were compared. Results: 426 CXRs were included in this audit loop. The two-hour target was achieved in 72% of all studied radiographs (previously 69%). Median time taken to issue a report was 67 minutes. For CXRs done between 9am and 5pm Monday-Friday, the performance was 73% (median time was 58 minutes). 71% of radiographs done out-of-hours were reported within 2 hours (median time was 72 minutes). 80% of all CXRs were reported within 4 hours. Conclusion: Performance has improved after the initial audit loop results from 2017 were presented locally. However, further action needs to be undertaken in order to increase the 2-hour target achievement rate. In addition to regular audits and staff education, the use of skills-mix and implementation of IT-based solutions such as pop-up reminders for radiologists could be possible solutions.